The "12" Holiday Gift for YOU to Look Good, Strikingly Gorgeous! This is the time of the year, we spend some money for our loved ones and for ourself (kena sayang diri jugalah...) and for me, it's also a time to stock up my skincare and personal care stocks - great deals and awesome discount everywhere, why not right? A quick few chats with my friends - it's always a daunting task and the attempt to find the perfect gift always lead to one big question: "what gift to buy ah?" is almost as good as every Malaysian will ask during LUNCH TIME: "wei, what to eat today ah?" and never getting a straight answer for sure. And then it strikes me that... "all I want for Christmas" is some self-pampering and good healthy skin, more importantly is.... great savings for the same thing you will be buying during normal, non-sales period. The moment you Google, a list of "12 gifts", a whole list of "12 this, 12 that" will magically fill your screen, probably very much because of "12 days of Christmas" song and I happened to have 12 "for HIM" grooming and skincare gift sets! I strongly suggest that you copy this link and "accidentally" hit SEND to everyone you can think of to buy you these amaaaaaaazing gifts. Let me remind you, this week is your last weekend before all the gift exchange begins, parties to attend, leading to Christmas Day, which is on Thursday, hence the weekend is CRUCIAL and IMPORTANT. First stop, I have L'Occitane. They have a good list of selection to choose from (you can shop online here), I have selected a few that I think will be a hit with you guys. Aromachologie Volumizing Mask Trio (RM259) - Shampoo, Conditioner and Mask! 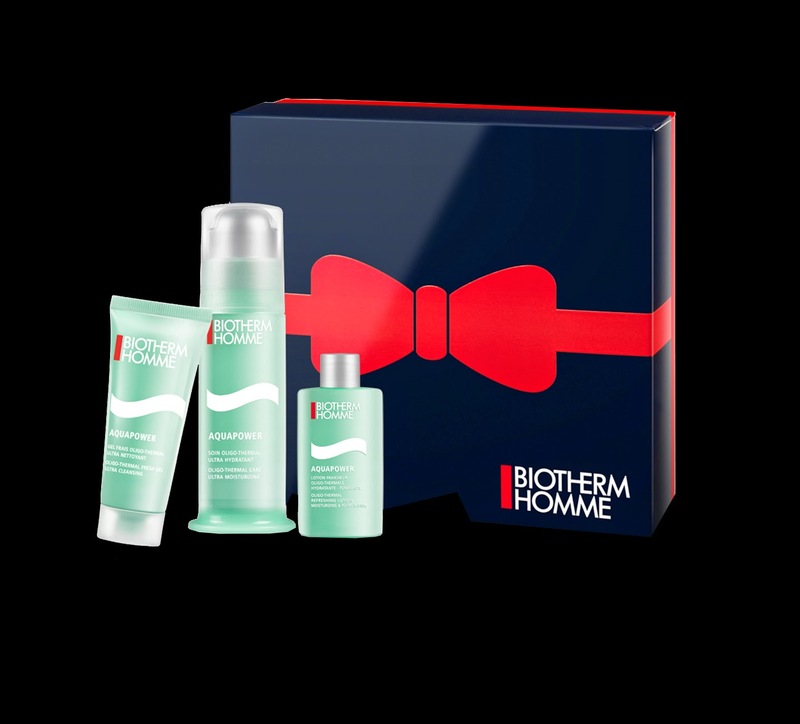 Verbana Body Travel Kit (RM83) - Body Lotion and Shower Gel (both 75ml) and Shea Butter Hand Cream (10ml) - and that gift box too! 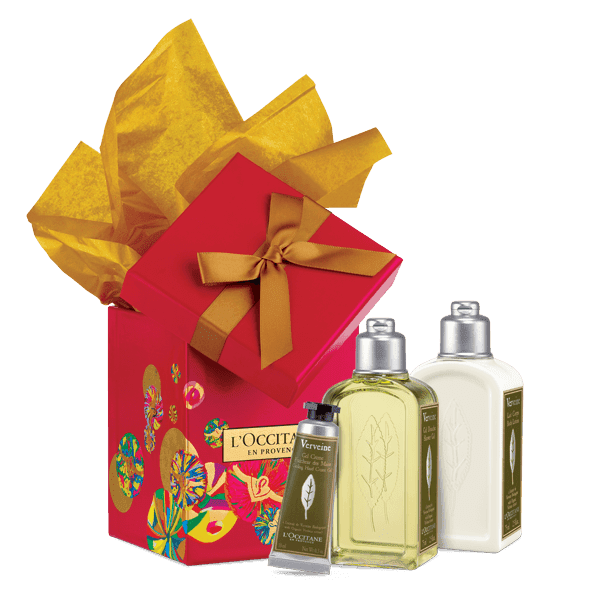 Verbana Hair & Body Set (RM355): Shampoo and Conditioner (both 500ml each) and Shower Gel (250ml) + L'Occitane Holiday Pouch! And here's something I cannot tahan and I buy this on the spot, which is the ALMOND CARE set! Jumbo size is only available during holiday season, so grab it before it is out of stock! Original price is RM379! Like I said - I cannot tahan, grab it and now currently using it! Awesome, wait for the review soon! Yes, with the gift box too! So if you are buying for others, it's presentable and look good!!! Worth the dollars you pay! I am so in love! 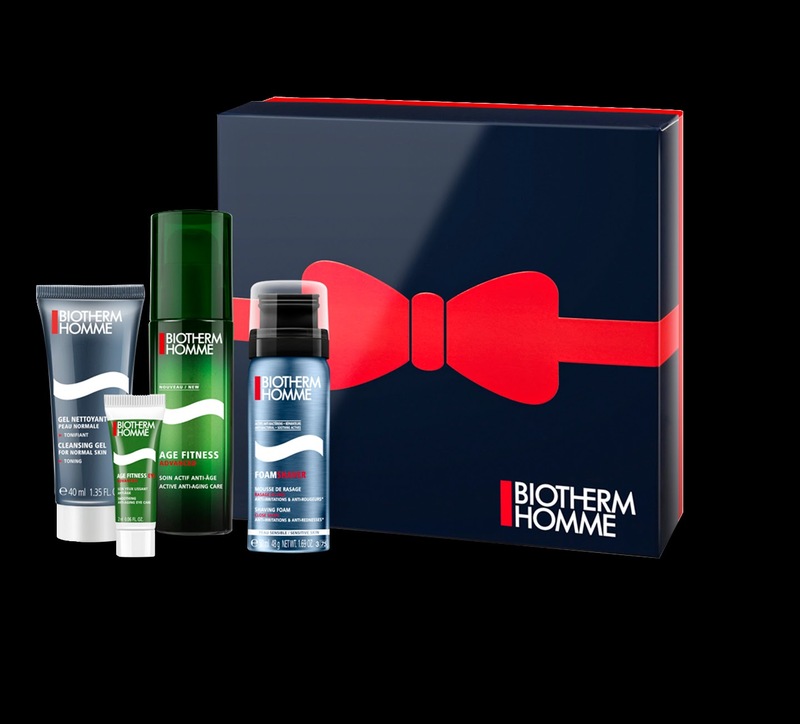 And let's move on to..... Biotherm Homme! For homme, it offers Age Fitness and Aquapower in set. Aquapower Christmas Set: Aquapower Moisturizer (75ml), Aquapower Shower Gel (75ml) and Foam Shaver (50ml) - simple and nice - but I wonder, why not include a cleanser and toner to make it a complete set? Want to know more about Aquapower? Click here. You may want to consider these amazing gift sets too. I usually get it during my trips but since I am celebrating Christmas here in Malaysia this year, I am considering to get Clinique's Happy for Him gift set here instead (come to think of it, I actually buy it EVERY year!) - time to get one too! Here's what Clinique has to offer. 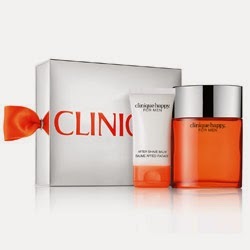 Happy for Him gift set: Clinique Happy for Men Cologne Spray (100ml) and After Shave Balm (50ml) - one of my favourite cologne/smell, the moment you smell it, you KNOW it's Clinique's Happy, it has that citrus and really fresh smell! Normal price of the Cologne Spray alone is RM215, so this gift set is.... just too awesome! Face wash, face scrub (both 50ml each), moisturizing lotion (40ml) and Anti-Age Eye Cream (15ml), it is suitable for normal to dry skins. Perfect travel size and the plus point? Complete set! Why is it essential? I tell you, men's skin can produce so much oil at times, it's enough to fry some eggs with it. Uuuurgh! I would like to introduce to you.... Melvita - eco-friendly and organic based products, which I find very interesting. I am not familiar with Melvita but I will be, very soon, the review will be out soon too! 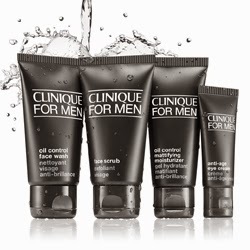 This is "Manly Essentials" (RM118, instead of RM169, you actually save RM51, which is 30%), it has a cleansing gel (100ml) and one shower gel (200ml). Seems like a good deal! Melvita's Matte & Fresh (RM185, instead of RM218): it has one Purifying Foaming Gel (200ml) and one Mattifying Fluid (40ml) - I am very attracted to this purifying foaming gel... ahem! This foaming gel help to balance skin with purifying active ingredients - peppermint hydrolat, wasabi extract and birch sap! Not only that, it has zinc extracts to help regulates sebum production, so our manly skin is SHINE-FREE! You probably didn't realized 11 gift sets is revealed here, I only got one more to go. SK-II Essentials Set (RM784), it has Facial Treatment Essence Black Limited Edition (215ml), Moisturizing Cleanser (120g) and UV Protect Moisturizer (50g) - the design that you see here is by collaborating Taiwanese artist: Po-Chih Huang. Yes, it's limited edition peeps! For those big, huge SK-II fans, this is a must have for you then! While you are here, watch this video from SK-II, "A Gift to Celebrate LOVE". And yes, you can buy online too! And I am done with the BIG 12! And if you got more idea or come across some awesome deals too, buzz me or drop me email, I will look into it as well. Happy shopping for your skincare! For women reading this, I hope this help you to groom your man, show him how much you love him! "Sifu" is here to save your day! Big Bad Wolf 2014 – Everything you need to know! Hey! It's Beginning to Look A Lot Like Christmas!